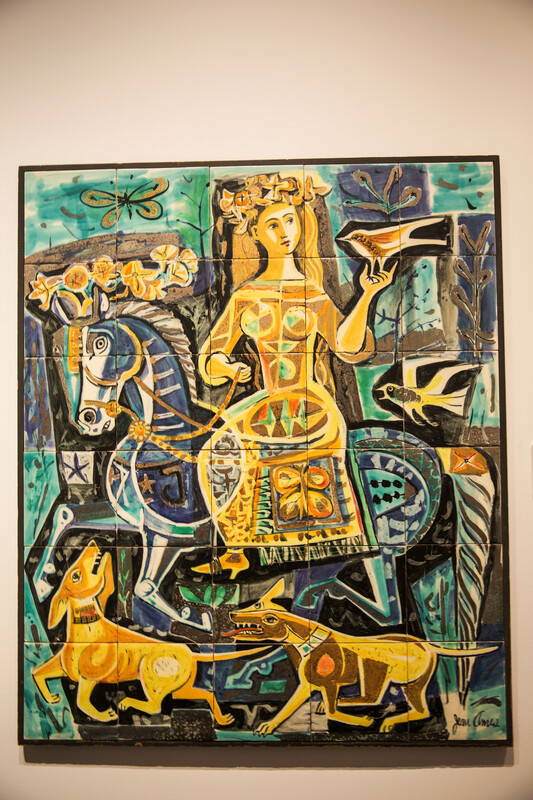 Visit the Claremont Museum of Art (CMA) this fall, and you will encounter a lively menagerie: mermaids glide in crystalline waters, horses gallop across rolling foothills, and cats impishly peer out at passersby. The exhibition, Primal Nature: Animalia by Women in Post-War Claremont, features fauna of various stripes and feathers represented in a variety of media—from sculptures in bronze, clay, and wood to watercolor paintings to wool fiber needlework—all by Claremont women artists, including several Scripps alumnae. 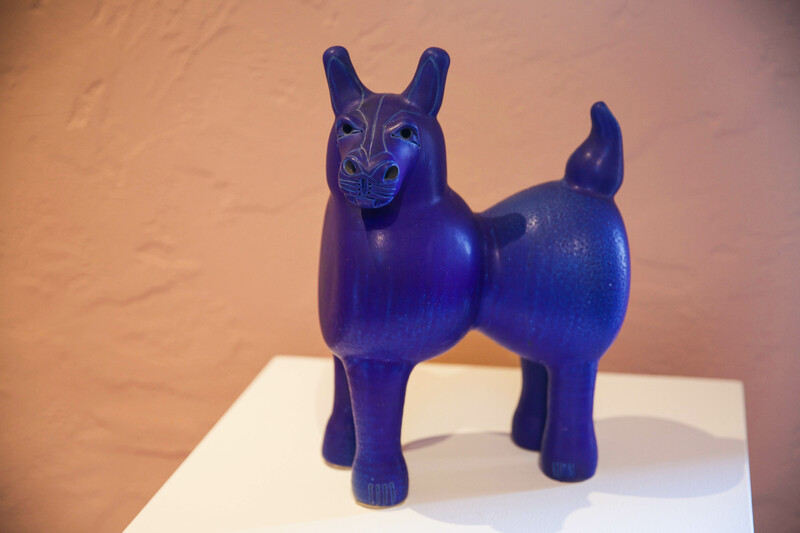 The exhibition was curated by Susan M. Anderson, who formerly worked at the Montgomery Gallery of Pomona College and the Laguna Art Museum and is now an independent curator and art historian. And at her side was Linnea Rosenberg ’19, who served as a curatorial research and exhibition installation assistant through an internship supported by the Millard Sheets Art Internship Grant. 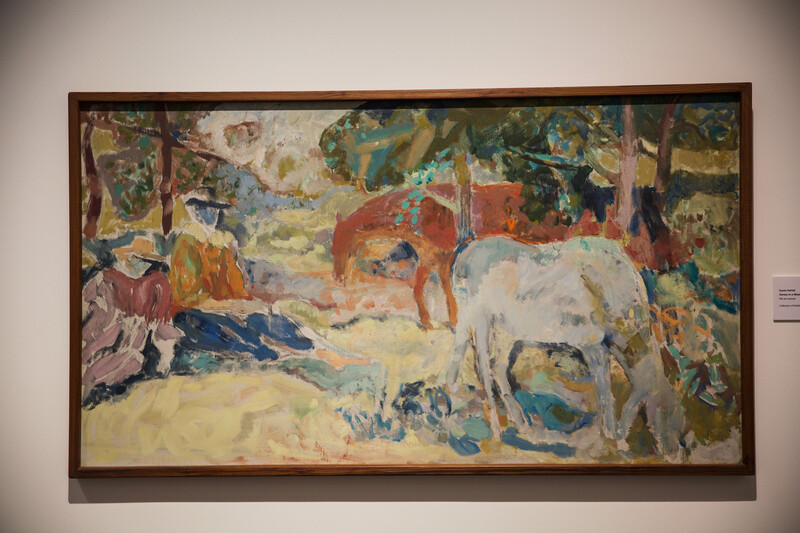 According to Anderson, animals, both real and fantastic, occupied an important place in artistic expression in mid-20th-century Claremont. “A primary part of the Arts and Crafts Movement in Southern California for fine artists was their engagement with nature,” explains Anderson, whose critical specialty is the arts in California. “Perhaps the focus on animals that we see was, to some extent, a channeling of this engagement with nature in a new direction. It may also have been an expression of a primal energy—there is clearly a kinship with animals among the artists represented,” she says. Among the 11 artists represented, an impressive four studied at Scripps, including Marjorie Burgeson ’50, Betty Davenport Ford ’46, Susan Hertel ’52, and Martha Underwood ’56. Additionally, work by Jean Goodwin Ames, Scripps’ first professor of Drawing and Design, is included; she was a faculty member of the College from 1940 until 1969. The exhibition is part of a city-wide initiative to recognize women who have been instrumental in Claremont’s civic and cultural history. According to Claremont Heritage Executive Director David Shearer, the “Claremont’s Women of Art and Culture” theme for 2018 (which inspired the focus on Claremont women at the CMA exhibition) was borne of a desire to “honor the legacy of women who affected the cultural dynamic of [the city],” adding that Scripps has been instrumental in making Claremont what it is today. “Scripps was a powerhouse in the mid-twentieth century with regard to art and architecture,” he says. Catherine McIntosh ’76, who serves on the board of the Claremont Museum of Art and studied art and psychology at Scripps, also emphasizes the interconnectedness of Scripps and the city’s artistic heritage. “It started when Millard Sheets came to teach at Scripps—he brought with him so many working artists who became part of the community, opening studio spaces in town and teaching at the Colleges—the 1950s and ’60s were really a golden age of art in Claremont,” she says. Anderson will be giving a talk at Scripps on the women artists featured in the exhibition and their contributions as ceramists, painters, enamellists, and sculptors, as well as their contributions as educators, promoters and community-builders for the arts in Claremont after WWII. The talk is free and open to the public and will take place on October 10 at 1:15 in the Hampton Room, as part of a luncheon event sponsored by Scripps’ Fine Art Foundation. For more information and to RSVP to the luncheon, click here.